I was contemplating what to share with you for this edition of weekend fare and remembered that I had some lovely salmon fillets in the freezer. We haven't shared much in the way of seafood here. Honestly, my family doesn't eat enough fish. It's so good for you, it's a quick meal, and it's delicious but it's one of those proteins I don't think to make very often. This beautiful salmon was very red - it's wild caught alaskan salmon. I was a bit disappointed that I overbaked it a little so it wasn't as moist as I would have liked but we really liked the glaze on these fillets. 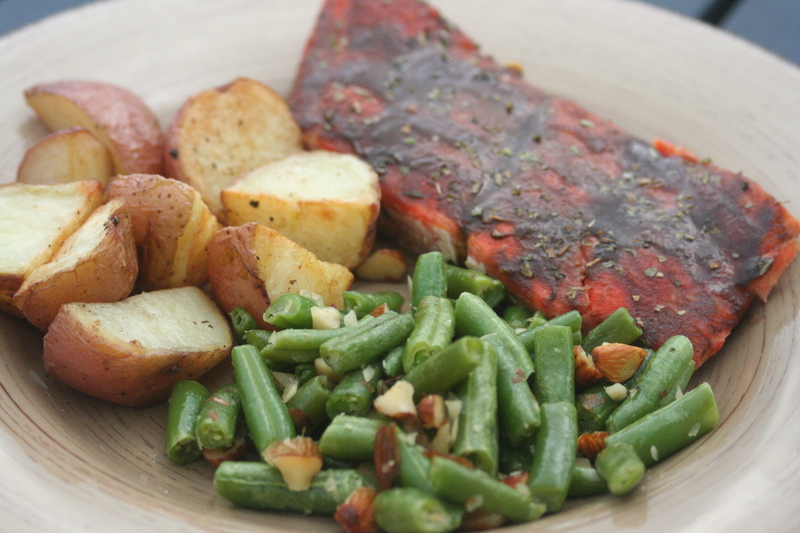 I served the salmon with roasted potatoes and almond green beans which we really enjoyed! Preheat oven to 400 degrees. Line a baking sheet with aluminum foil, and spray with non-stick cooking spray. Coat a small saucepan with non-stick cooking spray. Over medium heat, cook and stir garlic until soft, about 3 minutes. Mix in white wine, honey, balsamic vinegar, mustard, and salt and pepper. Simmer, uncovered, for about 3 minutes, or until slightly thickened. Divide in half. 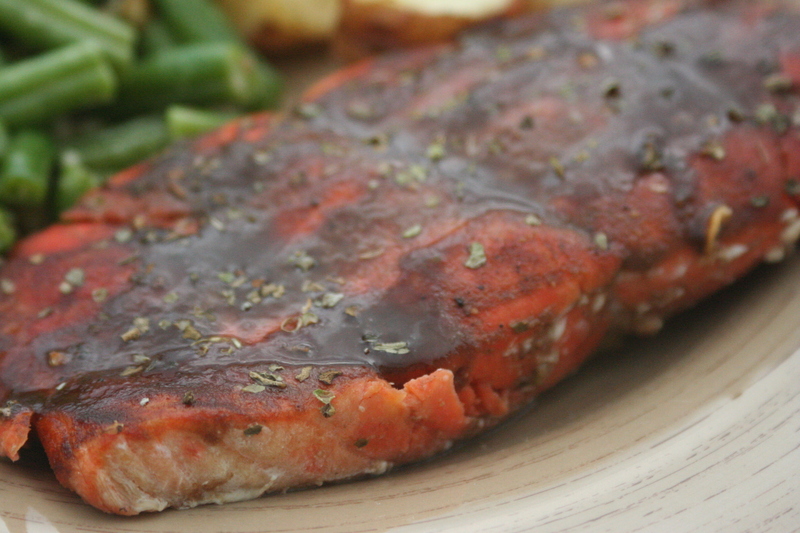 Arrange salmon fillets on the greased, foil-lined baking sheet. Brush fillets with half of the balsamic glaze, and sprinkle with oregano. Thanks for sharing this recipe. I baked salmon once and it stunk up our kitchen for two days. Is that just par for the course when cooking fish? I haven't had too much trouble with it smelling. Hmm... You might try baking it covered - I wish I would have done that in retrospect. And maybe try running your vent while it's baking. It might just depend on the fish - it's age, type etc. I make quite a bit of fish around here, and I'm always looking for new ways to season it. This sounds delicious! I've been baking salmon in parchment paper packets with lemon peel, green beans, olive oil, salt and pepper. It's moist, lemony, and delicious. Yum!! Beautiful recipe :-) The only type of fish we can get cheaply here is tilapia (firm, fresh white-fleshed fish) which I once cooked in a package of grease-proof paper with julienned vegetables (carrots, spring onions and peppers), a sweet-and-sour sauce and salt & pepper. Amazing! !